SunLighting™ Africa is a Program created to replace 300 Million kerosene lamps, used for lighting, with portable photovoltaic LED systems. For the first time 300 million African households will have a clean and safe source of light. The Program will reduce 12 Billion of liters of kerosene per year and therefore 24 Million of tons of CO2 will be reduced per year. This Program will be presented under the Clean Development Mechanism. 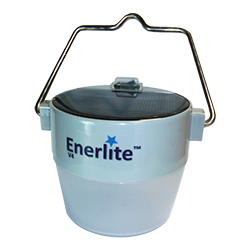 Enerlite™ is the most performing portable Solar Lantern on the market. The 4 Hi-Tech LED’s of more than 120 lumens per watt, give up to 65 lumens for 8h per day.